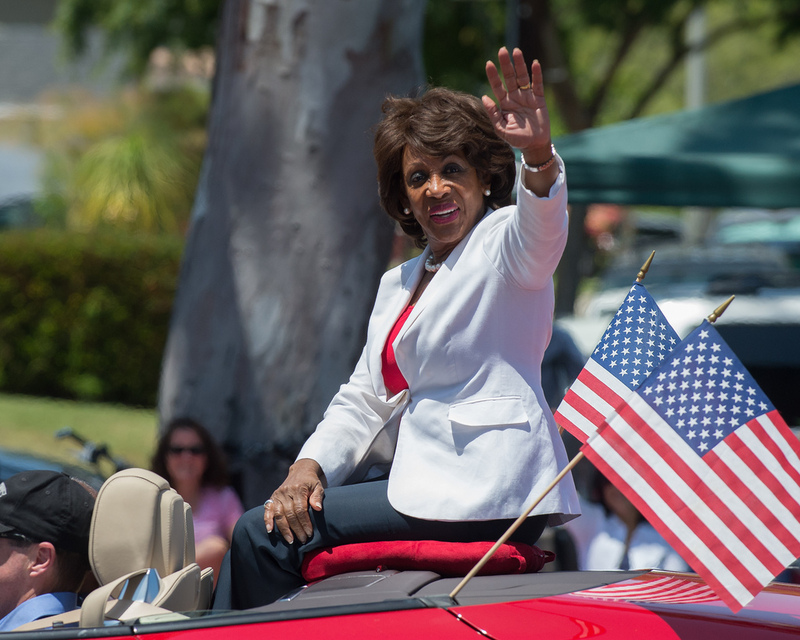 ST. LOUIS – Congresswoman Maxine Waters, D-California, will be the keynote speaker at the St. Louis County NAACP’s 2017 Freedom Fund Leadership Dinner. She, along with former Missouri Gov. Bob Holden, will receive the Margaret Bush Wilson Lifetime Achievement Award, in honor of one of Missouri’s most prominent civil rights activists. St. Louis County NAACP President Esther Haywood said she was “pleased” to present Waters with the award. “She has worked to advance civil rights through substantive legislation that increases opportunities all across this nation and has become widely known as a fierce advocate who won’t back down,” she said in a statement. Waters has deep roots to the St. Louis area. She was born in St. Louis and graduated from Vashon High School. Shortly after graduation, however, she moved to Los Angeles before working in the office of city councilman David Cunningham, Jr. She was elected to the California General Assembly in 1976 and has held elected office ever since, eventually moving to the position of caucus chair in the statehouse and later to the U.S. House of Representatives in 1990. She is currently one of 12 black women in Congress. The Freedom Fund Leadership Dinner will take place June 22 at the Clayton Ritz-Carlton at 5 p.m. This article first appeared on the Missouri Times. MpkfFL I think this is a real great article.Much thanks again. Really Cool. I simply want to say I am just beginner to blogging and absolutely loved this website. More than likely I’m planning to bookmark your site . You definitely have awesome stories. Cheers for sharing with us your web site. magnificent submit, very informative. I’m wondering why the other specialists of this sector don’t notice this. You should proceed your writing. I’m sure, you’ve a huge readers’ base already! hello!,I love your writing so much! proportion we keep up a correspondence more approximately your article on AOL? I require an expert on this space to solve my problem. May be that’s you! Taking a look forward to see you. whoah this weblog is magnificent i love studying your articles. Keep up the great paintings! You realize, many people are searching round for this information, you could aid them greatly. You could definitely see your skills within the paintings you write. The world hopes for even more passionate writers like you who aren’t afraid to say how they believe. Always follow your heart. I truly wanted to write a small word in order to say thanks to you for these splendid hints you are giving on this site. My incredibly long internet research has at the end of the day been honored with reputable facts and techniques to exchange with my co-workers. I would admit that many of us readers actually are very blessed to dwell in a wonderful place with many special individuals with very beneficial solutions. I feel extremely privileged to have come across the website and look forward to many more excellent times reading here. Thanks a lot once again for everything. I’ve been surfing on-line greater than 3 hours as of late, but I never found any attention-grabbing article like yours. It is pretty worth sufficient for me. Personally, if all web owners and bloggers made excellent content material as you did, the web will likely be much more useful than ever before. Wonderful website. A lot of helpful info here. I¡¦m sending it to some friends ans also sharing in delicious. And of course, thank you for your sweat! you are truly a good webmaster. The website loading velocity is amazing. It sort of feels that you are doing any distinctive trick. In addition, The contents are masterpiece. you’ve done a fantastic task on this matter! I was just seeking this info for a while. After six hours of continuous Googleing, finally I got it in your website. I wonder what is the lack of Google strategy that do not rank this kind of informative web sites in top of the list. Generally the top sites are full of garbage. Thanks , I have recently been searching for info approximately this topic for a long time and yours is the best I’ve found out so far. However, what about the bottom line? Are you certain about the source? I needed to create you this little remark to finally thank you so much again on your pleasing tips you’ve shared on this page. It has been really shockingly generous of people like you to supply extensively what exactly a few people could possibly have made available as an e-book in order to make some profit on their own, precisely considering the fact that you could have done it in the event you desired. Those smart ideas as well served to become fantastic way to fully grasp many people have a similar fervor the same as my own to grasp a good deal more around this condition. I believe there are thousands of more pleasurable situations in the future for many who check out your site. Nice post. I was checking constantly this blog and I am impressed! Very helpful info specifically the last part 🙂 I care for such information much. I was seeking this particular info for a long time. Thank you and good luck. I really wanted to write a simple comment in order to say thanks to you for these magnificent tips and hints you are sharing on this site. My long internet lookup has now been honored with beneficial ideas to talk about with my friends and family. I ‘d suppose that we site visitors are unquestionably lucky to dwell in a remarkable network with so many marvellous professionals with beneficial points. I feel somewhat fortunate to have come across the website and look forward to many more entertaining minutes reading here. Thanks a lot once again for a lot of things. I was just looking for this info for a while. After six hours of continuous Googleing, at last I got it in your website. I wonder what’s the lack of Google strategy that don’t rank this kind of informative sites in top of the list. Usually the top sites are full of garbage. I together with my guys appeared to be checking out the best solutions located on the website then all of the sudden I got an awful suspicion I never expressed respect to the web site owner for them. My women were definitely stimulated to see all of them and have now without a doubt been tapping into these things. We appreciate you being indeed accommodating and also for selecting varieties of extraordinary subjects millions of individuals are really wanting to understand about. Our sincere regret for not expressing gratitude to you earlier. I actually wanted to send a brief word in order to appreciate you for these nice tips and tricks you are giving on this site. My time-consuming internet lookup has finally been compensated with sensible concept to share with my visitors. I ‘d repeat that most of us website visitors are undeniably lucky to live in a very good community with so many outstanding people with interesting methods. I feel pretty happy to have seen your entire weblog and look forward to really more cool times reading here. Thanks a lot once more for everything. Helpful information. Lucky me I discovered your website unintentionally, and I’m stunned why this accident didn’t took place earlier! I bookmarked it. Very good written information. It will be supportive to everyone who utilizes it, as well as myself. Keep up the good work – looking forward to more posts. I’ve been browsing online greater than three hours today, yet I never discovered any interesting article like yours. It is lovely value enough for me. In my view, if all site owners and bloggers made just right content as you probably did, the net can be a lot more useful than ever before. I definitely wanted to send a message to appreciate you for all of the magnificent instructions you are writing at this website. My considerable internet research has finally been honored with awesome details to share with my partners. I ‘d mention that many of us visitors are really fortunate to exist in a great site with many special professionals with very helpful opinions. I feel pretty privileged to have encountered your webpages and look forward to plenty of more pleasurable times reading here. Thanks a lot once again for all the details. I¡¦m now not positive where you are getting your information, however good topic. I must spend a while finding out much more or understanding more. Thank you for magnificent info I was on the lookout for this info for my mission. hello!,I love your writing so much! percentage we communicate more approximately your post on AOL? I require a specialist in this area to resolve my problem. May be that is you! Taking a look forward to look you. I’m still learning from you, as I’m improving myself. I absolutely love reading everything that is posted on your site.Keep the aarticles coming. I enjoyed it! Thanks so much for giving everyone an extraordinarily spectacular possiblity to check tips from here. It’s always very kind and also packed with a great time for me and my office friends to search your site no less than three times in one week to read the fresh things you will have. And definitely, I am just usually satisfied concerning the impressive thoughts you serve. Certain 4 facts in this post are surely the best I have had. Usually I don’t learn post on blogs, but I would like to say that this write-up very pressured me to take a look at and do it! Your writing style has been amazed me. Thanks, quite nice post. It is appropriate time to make some plans for the future and it’s time to be happy. I’ve read this post and if I could I want to suggest you some interesting things or suggestions. Maybe you could write next articles referring to this article. I want to read more things about it! Excellent website. A lot of useful info here. I’m sending it to some pals ans additionally sharing in delicious. And certainly, thanks to your sweat! I am not positive where you are getting your info, but great topic. I needs to spend a while studying much more or understanding more. Thanks for excellent information I used to be in search of this info for my mission. Very good written information. It will be helpful to anyone who utilizes it, as well as yours truly :). Keep doing what you are doing – can’r wait to read more posts. Excellent goods from you, man. I have understand your stuff previous to and you’re just too wonderful. I actually like what you have acquired here, really like what you’re stating and the way in which you say it. You make it enjoyable and you still care for to keep it smart. I can’t wait to read much more from you. This is really a tremendous site. Thank you so much for providing individuals with such a superb possiblity to read from this site. It really is very superb and as well , jam-packed with amusement for me and my office mates to search the blog a minimum of three times in 7 days to find out the fresh guidance you have. And lastly, I am certainly happy considering the fantastic ideas you serve. Selected 4 points on this page are in fact the finest we have had. Helpful information. Lucky me I discovered your site by accident, and I’m shocked why this coincidence did not came about in advance! I bookmarked it. Needed to draft you that little remark to say thanks a lot once again about the splendid methods you’ve provided in this case. It’s really incredibly open-handed of people like you to present unhampered all that a number of people might have sold as an e-book to help with making some profit for themselves, mostly since you could possibly have tried it if you ever considered necessary. Those tactics as well served as a great way to be aware that the rest have the same dreams much like my personal own to understand whole lot more with regards to this condition. I am certain there are some more pleasant instances up front for those who look into your blog post. hello!,I love your writing very so much! percentage we keep in touch extra approximately your article on AOL? I require a specialist on this area to unravel my problem. Maybe that’s you! Looking ahead to look you. I genuinely enjoy looking through on this web site , it has wonderful content . “For Brutus is an honourable man So are they all, all honourable men.” by William Shakespeare. I wish to express thanks to you for rescuing me from this particular difficulty. As a result of looking through the the web and finding advice which were not powerful, I figured my life was over. Being alive without the approaches to the difficulties you have resolved through your entire review is a critical case, as well as ones which may have negatively damaged my entire career if I had not noticed the blog. The ability and kindness in handling all the things was crucial. I don’t know what I would have done if I hadn’t come upon such a stuff like this. I am able to now look forward to my future. Thank you very much for this skilled and amazing help. I will not be reluctant to propose the blog to any individual who should get support on this subject. I do believe all the ideas you’ve presented for your post. They’re really convincing and can certainly work. Nonetheless, the posts are very brief for novices. May just you please extend them a bit from subsequent time? Thank you for the post. What i don’t realize is in fact how you are not really a lot more well-preferred than you might be right now. You’re very intelligent. You recognize therefore considerably in terms of this matter, produced me in my opinion believe it from so many various angles. Its like men and women are not involved until it¡¦s one thing to do with Girl gaga! Your personal stuffs nice. All the time maintain it up! Thanks for your own labor on this web page. My niece takes pleasure in engaging in research and it is obvious why. A lot of people hear all of the lively form you provide informative items via the blog and as well as increase participation from website visitors on the area plus our own girl is certainly understanding so much. Have fun with the remaining portion of the new year. You’re the one carrying out a great job. Thank you for sharing excellent informations. Your web-site is so cool. I’m impressed by the details that you’ve on this blog. It reveals how nicely you understand this subject. Bookmarked this website page, will come back for extra articles. You, my pal, ROCK! I found just the information I already searched everywhere and simply couldn’t come across. What an ideal site. Fantastic site. Lots of helpful information here. I am sending it to some buddies ans also sharing in delicious. And obviously, thanks to your sweat! I actually wanted to construct a small remark in order to say thanks to you for all the fantastic instructions you are placing at this website. My prolonged internet look up has at the end been honored with sensible tips to go over with my company. I would mention that many of us website visitors are definitely fortunate to be in a decent community with so many brilliant people with very beneficial plans. I feel very grateful to have seen the website page and look forward to many more excellent times reading here. Thank you once again for a lot of things. I’m also commenting to let you be aware of what a incredible discovery my cousin’s girl enjoyed checking your web site. She realized too many details, which included what it’s like to possess a very effective coaching mindset to have the mediocre ones effortlessly comprehend various complicated subject areas. You truly exceeded her expectations. Thank you for showing the valuable, trustworthy, informative and cool guidance on your topic to Janet. Wow, incredible weblog structure! How long have you ever been blogging for? you make blogging look easy. The full look of your website is magnificent, as smartly as the content material! ovejlbaptn,A fascinating discussion is definitely worth comment. I do think that you ought to publish more on this topic, it may not be a taboo eaghhs,subject but generally folks don’t talk about such subjects. To the next! All the best!! I’ve recently started a website, the information you provide on this website has helped me tremendously. Thank you for all of your time & work. “So full of artless jealousy is guilt, It spills itself in fearing to be spilt.” by William Shakespeare. I am no longer positive the place you’re getting your information, but great topic. I needs to spend a while studying more or figuring out more. Thank you for fantastic information I was searching for this info for my mission. It is in reality a great and useful piece of information. I am happy that you just shared this useful information with us. Please keep us informed like this. Thank you for sharing. I needed to write you a little bit of remark to help say thank you as before for those spectacular things you’ve contributed in this case. This is particularly open-handed with you to allow easily what exactly a number of us could possibly have offered as an e book to help make some cash for themselves, certainly seeing that you could possibly have tried it in case you wanted. These thoughts additionally served as a good way to be certain that the rest have the same eagerness similar to my personal own to grasp good deal more in respect of this issue. I think there are thousands of more fun sessions in the future for individuals who view your blog post. I definitely wanted to write a brief message so as to appreciate you for all of the fantastic tactics you are posting at this website. My incredibly long internet research has now been paid with useful concept to share with my company. I ‘d express that we website visitors are rather endowed to be in a great network with so many brilliant individuals with useful tactics. I feel truly happy to have encountered your web site and look forward to plenty of more entertaining moments reading here. Thanks a lot again for everything. Some truly nice and useful information on this site, likewise I conceive the pattern has excellent features. A lot of thanks for all your labor on this web site. My niece enjoys participating in research and it is obvious why. A lot of people notice all relating to the compelling mode you make vital thoughts via this blog and even increase contribution from people on this idea so our own simple princess is actually studying a lot of things. Enjoy the remaining portion of the year. You’re the one conducting a pretty cool job. Hello there, I found your web site by the use of Google while looking for a similar topic, your site came up, it seems great. I’ve bookmarked it in my google bookmarks. hey there and thank you for your information – I have certainly picked up something new from right here. I did however expertise some technical issues using this website, since I experienced to reload the web site many times previous to I could get it to load correctly. I had been wondering if your web hosting is OK? Not that I’m complaining, but sluggish loading instances times will often affect your placement in google and could damage your high-quality score if advertising and marketing with Adwords. Anyway I am adding this RSS to my e-mail and can look out for a lot more of your respective exciting content. Make sure you update this again very soon.. Thanks for sharing excellent informations. Your web-site is so cool. I’m impressed by the details that you¡¦ve on this blog. It reveals how nicely you understand this subject. Bookmarked this website page, will come back for more articles. You, my friend, ROCK! I found just the information I already searched all over the place and just couldn’t come across. What a great website. mnwagyokq,Thanks for sharing such an amazing blog. I am so happy found this informative blog. Thanks a lot for providing individuals with a very marvellous opportunity to read articles and blog posts from this blog. It is usually so brilliant plus packed with a lot of fun for me and my office fellow workers to search your web site nearly thrice in one week to read through the newest tips you have. Of course, I’m so usually impressed concerning the eye-popping secrets you serve. Certain 1 points in this post are in truth the best we have all ever had. Normally I don’t learn post on blogs, however I would like to say that this write-up very pressured me to try and do so! Your writing taste has been surprised me. Thank you, very nice article. Thank you for your own effort on this site. Gloria really loves participating in investigation and it’s obvious why. I notice all relating to the compelling ways you offer practical tricks through your blog and as well as welcome response from website visitors about this area then our child is without question becoming educated a lot of things. Have fun with the rest of the year. You are always carrying out a glorious job. I wanted to compose a small message in order to appreciate you for those wonderful items you are showing on this website. My prolonged internet look up has at the end been honored with pleasant points to go over with my friends. I ‘d repeat that many of us visitors are undoubtedly fortunate to dwell in a good site with many perfect people with great opinions. I feel really fortunate to have come across your site and look forward to really more pleasurable times reading here. Thanks a lot once more for everything. I will right away grab your rss as I can’t to find your email subscription link or e-newsletter service. Do you’ve any? Please permit me understand in order that I may subscribe. Thanks. Valuable info. Lucky me I discovered your website accidentally, and I am shocked why this twist of fate did not happened in advance! I bookmarked it. you’re in reality a just right webmaster. The website loading velocity is incredible. It kind of feels that you are doing any distinctive trick. Also, The contents are masterwork. you’ve done a fantastic task in this subject! wlsfcn,Wonderful one thank you so much ! Normally I don’t learn post on blogs, but I would like to say that this write-up very pressured me to take a look at and do it! Your writing style has been surprised me. Thanks, very great article. My wife and i felt so ecstatic when Jordan managed to finish up his web research through the ideas he received out of your weblog. It’s not at all simplistic to just continually be releasing ideas others could have been selling. Therefore we realize we need the writer to appreciate because of that. The illustrations you made, the simple web site navigation, the friendships your site help to create – it’s many fabulous, and it’s really letting our son in addition to the family imagine that this article is pleasurable, which is really mandatory. Thank you for the whole lot! I in addition to my friends have been looking at the good procedures on the blog while unexpectedly I had a horrible feeling I never expressed respect to you for those tips. Most of the ladies were definitely for this reason joyful to study them and already have simply been using these things. We appreciate you being quite considerate and also for finding varieties of excellent themes millions of individuals are really needing to know about. My very own sincere apologies for not saying thanks to you earlier. Keep up the good work , I read few content on this site and I believe that your web blog is really interesting and has got lots of wonderful info . Only wanna input on few general things, The website design is perfect, the articles is really wonderful : D.
Wonderful site. A lot of helpful info here. I¡¦m sending it to several buddies ans additionally sharing in delicious. And obviously, thanks to your sweat! Usually I do not read post on blogs, but I would like to say that this write-up very pressured me to take a look at and do it! Your writing style has been amazed me. Thank you, very nice post. I simply needed to thank you so much once again. I’m not certain the things that I might have carried out without the actual smart ideas revealed by you about such a question. Completely was a real scary issue in my opinion, nevertheless coming across the expert tactic you handled that took me to jump over fulfillment. I will be thankful for this information and sincerely hope you find out what an amazing job you are accomplishing training the others all through a web site. I’m certain you have never got to know all of us. obviously like your web-site but you need to take a look at the spelling on quite a few of your posts. Many of them are rife with spelling issues and I find it very bothersome to tell the reality however I’ll definitely come again again. I simply couldn’t depart your website prior to suggesting that I really loved the usual info an individual supply in your guests? Is gonna be again ceaselessly to check out new posts. Thanks for sharing excellent informations. Your web-site is very cool. I am impressed by the details that you have on this web site. It reveals how nicely you understand this subject. Bookmarked this website page, will come back for more articles. You, my pal, ROCK! I found just the information I already searched everywhere and just could not come across. What a perfect website. Valuable info. Fortunate me I discovered your site by chance, and I am surprised why this accident didn’t came about earlier! I bookmarked it. Excellent website. Lots of useful information here. I am sending it to a few friends ans also sharing in delicious. And naturally, thanks in your sweat! Great post. I was checking constantly this blog and I am impressed! Extremely helpful info specially the last part 🙂 I care for such info much. I was seeking this certain information for a very long time. Thank you and best of luck. Very efficiently written story. It will be supportive to anybody who usess it, including myself. Keep up the good work – can’r wait to read more posts. You made a few fine points there. I did a search on the topic and found the majority of persons will agree with your blog. I just want to say I am just beginner to blogging and site-building and absolutely loved this web page. More than likely I’m want to bookmark your website . You certainly come with exceptional stories. Bless you for sharing with us your website. hello!,I really like your writing so a lot! percentage we communicate extra about your article on AOL? I require an expert on this area to solve my problem. May be that’s you! Taking a look forward to see you. You really make it appear really easy together with your presentation but I in finding this matter to be actually one thing which I feel I might never understand. It kind of feels too complicated and very wide for me. I’m taking a look forward to your subsequent publish, I¡¦ll attempt to get the hold of it! I must express my appreciation to the writer just for bailing me out of this type of challenge. As a result of looking through the online world and seeing tricks that were not pleasant, I believed my life was gone. Being alive devoid of the strategies to the issues you have resolved through your main guide is a crucial case, as well as the kind which might have in a negative way affected my career if I had not encountered your web blog. Your own personal capability and kindness in controlling the whole lot was crucial. I don’t know what I would have done if I hadn’t come upon such a subject like this. I am able to at this time look ahead to my future. Thanks for your time so much for the skilled and results-oriented help. I will not hesitate to endorse your web blog to any person who should have care on this issue. Thanks for any other fantastic post. Where else may anyone get that type of info in such an ideal means of writing? I have a presentation subsequent week, and I am on the search for such info. Thanks a lot for providing individuals with a very pleasant chance to read from this site. It is always so amazing and packed with a good time for me personally and my office co-workers to search your web site at minimum 3 times every week to study the new secrets you have. And definitely, I’m just at all times satisfied considering the unbelievable pointers you serve. Certain 2 areas in this posting are unequivocally the most efficient we’ve ever had. I have been surfing online greater than 3 hours lately, but I by no means found any interesting article like yours. It¡¦s pretty worth sufficient for me. In my view, if all web owners and bloggers made good content as you probably did, the internet will likely be much more helpful than ever before. Somebody essentially assist to make significantly articles I’d state. That is the very first time I frequented your website page and thus far? I surprised with the analysis you made to create this actual submit incredible. Magnificent task! whoah this blog is great i really like reading your articles. Keep up the great work! You know, lots of people are hunting round for this info, you can help them greatly. It¡¦s really a cool and useful piece of information. I¡¦m glad that you just shared this useful information with us. Please keep us up to date like this. Thanks for sharing. obviously like your web-site but you have to take a look at the spelling on several of your posts. Several of them are rife with spelling problems and I in finding it very troublesome to tell the truth on the other hand I¡¦ll surely come back again. On my buddy’s blog sites they have included me on their blog site rolls, however mine always sits at the bottom of the checklist and does not list when I upload like it does for others. Is this a setting that I need to alter or is this an option that they have made?. You made certain nice points there. I did a search on the issue and found a good number of persons will agree with your blog. I am now not sure the place you are getting your info, but great topic. I must spend some time finding out much more or figuring out more. Thanks for great information I was searching for this information for my mission. I simply wanted to send a quick message to express gratitude to you for the amazing tips and hints you are placing at this site. My long internet lookup has finally been rewarded with high-quality content to go over with my family members. I ‘d declare that many of us visitors actually are undoubtedly blessed to be in a notable website with many wonderful people with great secrets. I feel extremely happy to have used the website page and look forward to really more enjoyable moments reading here. Thanks a lot again for a lot of things. how come some blogs in a blogroll do not have their latest message noted as well as others do? Just how to change that? I am asking for my mommy. She doesn’t always intend to generate income off them, her objective is to utilize her blog site (as soon as preferred) as well as use it as referrals to possibly assist her obtain a news article. She has a title for one called “Response to Life’s Problems”. Where can she post blog sites and they end up being prominent? She published it currently on WordPress yet there are 3 million people publishing blog sites hers obtains lost in the mix. Any pointers?.